-No word count; The role-player is not constrained by a certain count to provide, but keeping the pace with your partner is preferable. -Free-form application; you can simply provide your application as role-playing sample featuring your character's description, personality, and history. -Skill set system; a simple system used to show which aspect\attribute your character is better at in order to maintain a fair role-playing experience. -Mechanics under development to make Westeros more alive and immersive. -Site canons; they are the characters responsible to maintain the flow of our universe, consider them a starting scenario where you build your character upon. You are free to come out with your own personality and play-by for any site canon. If you think you have a plot which will benefit the site; then you can go on with it, and we will canonize your new character responsible for your new plot. 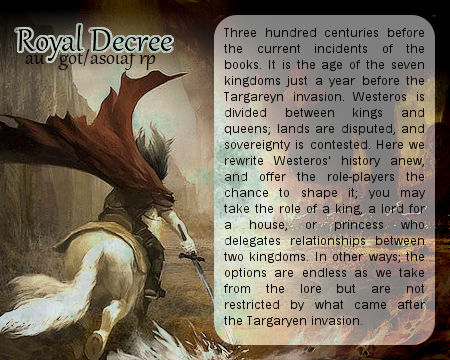 -Sand box experience based on the world of GoT; where your own plot and decisions change the world's fate. -Currently site canons and Nobility are needed.